Andrew Lindsay – Resource Concepts, Inc.
Andrew “Drew” Lindsay came to RCI in 2015 with over twenty-five years of customer service experience in Land Survey. Customer service in that every client comes in with specific needs, learning the nuances of these help us provide the services for each client. While being a capable student interested in natural sciences, he usually found joy with his head stuck in a map, or off seeing what was around the next bend in his birth state of West Virginia. With this restless approach, he ventured into college and attained a Bachelor of Sciences degree in geology from Dickinson College, and upon arriving in Nevada promptly did anything and everything but geology. 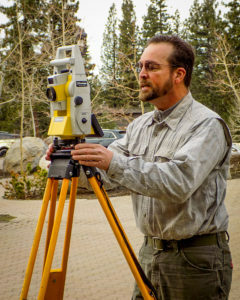 The journey of Land Surveying has earned him professional licenses in the states of Nevada and California, along a trajectory of historical change that encompasses the transition from traditional optical transit with steel tapes or stadia rods, to the incredible new world of electronics and satellite driven technologies. In all of this, he would still say that it is the people; those professionals he works with and the clients he has the pleasure of meeting, that make it most interesting. Ever curious about what other people are up to and enjoying a good life, it was a chance encounter on a water ski date that got Drew started on his path in surveying. That has now been many years ago!